Hands Stitched Promotional balls Its Cheap and Best Promotional items can keep your company name, phone number or web address in front of your customers Sialkot is known as land of sporting goods manufacturing and luckily we also belong to this area. We are an ISO9002 certified company-producing sports goods specialized in Soccer Ball we possesses a good name in manufacturing of these items. we are exporting the same to our many other over-seas customers, Mostly in Far East, Middle East, Europe & Australia with our local (own) & Foreign Brands and Style we can also use your graphic/design according to your demand. We by adopting very latest technology, we are in a well position to meet your all requirements regarding "Quality, Quantity & In-Time Delivery" at a very economical prices, however this will only be possible to quote you after having your valuable comments on our-e mail. offer you that just give us a chance to start business dealing, Check the Quality of our Samples & Products, you will definitely find the difference. In case you become interested in our items. Kindly feel free to write us for the specifications, prices & samples, which we shall be pleased to send you as soon as demanded for your kind consideration and quality check-up. 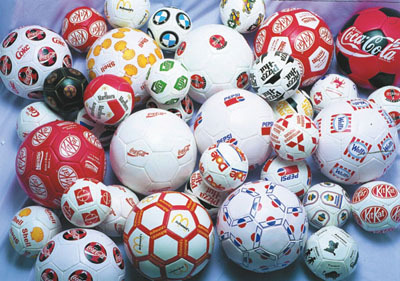 promotional soccer balls advertising Products Looking for advertising products? soccer-promotion.com offers huge selection of custom promo items. Improve traffic at trade shows and motivate staff. manufacturers importers & exporter of all kind of sports goods. We specialized in sports equipments; sports accessories suit your business requirements. We have a passion to provide premium quality products and offer diverse product range made from the best raw materials to bring out unmatched quality at most competitive prices. We take the full responsibility for export formalities and assured shipments to provide our clients smooth transactions. Our professional and quality conscious approach to the business has made us a reliable name in the market. Also, our competitive rates and well-organized system has added much to the marketability of our products. We are manufacturer and exporter of sports goods promotional soccer balls, gloves and martial arts. According to quality policy and business standard we are doing our business with the customers all over the world. We strictly follow the instructions of the customers to make the products beautiful and perfect. We ship the goods in time and use the fast vessel to make delivery in time. Our prices are very very cheap and acceptable. Our customers have established their business relationship and until this time they have no any complaint. Any logo, any printing, any bar code any brand name any text any stamp it's no problem for us to print on the ball. Please visit our website and send us your inquiry to offer you our good prices. Promotional Soccer balls from leading manufacturers and exporters of promotional soccer balls sports goods and Balls from Pakistan. manufacturing and exporting sports goods like Rugby balls mini soccer balls American & Australian Football Netballs Beach Volley ball various Promo Balls and a variety of logo sport goods and accessories. Promotional soccer items can create impact for marketingand promotions that can't be matched by paper brochures or other literature. Many items make unique promotional mailings, giveaways and handouts to promote your product, brand, image, or message for the best impressions. We customize our soccer manufacturing facility for your special market conditions. Private promotional footballs cusotm labeling and printing is done at very low prices.